We had a couple of fine new dogs start at The Fort on Sunday. First we met Red. He is a enthuisatic, four month old, forty pound, Yellow Labrador Retriever. Red is a lab pup with great energy! He fit right in, right away, with some of Fort Fido's most fast and furious players. 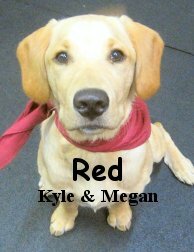 Red gets along superb with others, he will be able to do well in the Medium or Big Roll. That is always a plus for us. Outstanding job Red, we hope to see you back soon. 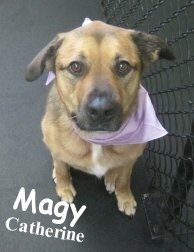 Later in the day, we were introduced to Magy. 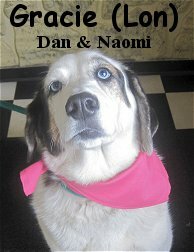 She is a six year old, sixty pound, Collie Mix. Magy is brown and black with a white chest. This gal has a very sweet temperament. Her entrance into the pack was impeccable and she is well versed in "Dog Speak". Magy was quite calm and confident around the others. Although she didn't play, she seemed to enjoy the experience. Magy will make a swell addition to our Medium Roll. The little guys getting ready for bed! We had a big weekend for boarding this time around, and it was really a "more the merrier" situation here. It's just priceless to see these pups snuggle up for the night, napping with their good buddies! First up in the clips is a good romp had by Gordon, Zipper, Winston, and Baer. They were all getting in on the action, and were a great high-energy little pack all day. These boys really know how to tear it up! But even after all that tearing it up, they keep on playing! Here Gordon and Zipper are a little slower than before, neckfighting as they each lounge on the floor. Maybe too tired to romp, but never too tired to play! In the news-- remember when I posted about a runaway dog causing a crash during a leg of the Tour de France? Well another loose pooch has found his way into a cycling event-- this time at the Olympics! At least this time nobody was hurt, and the race continued on unimpeded. There is a new World's Smallest Pooch! Tiny Bebe was certified by Guinness as the new record holder, standing at just six-and-a-half inches tall, and weighing only two-and-a-half pounds. I hope that you got to enjoy the sunshine this afternoon! The Desert Fox Rommel had his first day of daycare at the Fort today, though it's definitely not his first time at the rodeo! The 11-month-old Boxer fell right into the routine, and had a good time playing with two other big dogs, Jake and Cyrus. 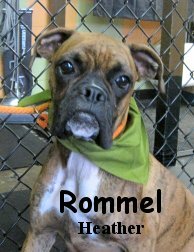 He's going to fit in well here, with our whole crew of really cool boxers (they tend to do really well in the daycare environment). We look forward to seeing him again soon! P.S.-- Here is a really heartfelt story about a whole town coming together to help a drifter and his dog; also, a dog saves a woman's life by sniffing out an aggressively growing tumor. 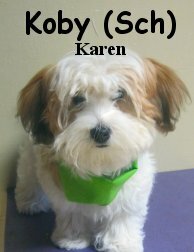 Meet Koby-- a sweet little 18-week-old Havanese that started attending the Fort this morning. He was very self confident up with the other little guys (he only weighs four-and-a-half pounds! ), and while he didn't play much today, we expect to see him getting more into the groove as he continues to attend. For today, he was just checking it out and taking it in. In this clip from upstairs, Koby can be seen watching Marlee and Cortez have a romp. Those two play pretty hard, so I'm not surprised that the new pup was a little trepidatious about joining in with them. Once they slowed down toward the end, Koby went over to give them a few good sniffs. He was also a bit more interested in Jaya with the camera--sometimes it's hard to get clips, when just being in the play area can be so distracting! We look forward to seeing you back with us, Koby! I don't normally read Fiction, but when I do, I fancy medieval folk/fantasy type of stuff (Wow, lol, sounded like the Dos Equis guy for a minute). Anywho, I'm currently reading J.R.R. Tolkien's "Tales from the Perilous Realm" and have been loving it. Tolkien has to be my favorite for fiction. Like many, I fell in love with The Hobbit at a young age. I also thoroughly enjoy his writing style... Who says you can't have run-on sentences and the overuse of parenthesis (I really like using them haha)? Tales from the Perilous Realm is a collection of short stories. The dog related story, Roverandom, is the first story in the collection and it gave me quite a chuckle. It is about a little dog, Rover, who gets turned into a toy dog by a grumpy wizard. For some reason, it reminds me of my childhood and my own dog. Definitely check this story out, especially if you have young ones to read to. However, anyone can and probably will adore it. I wanted to share a little excerpt from the Roverandom tale, it's my favorite part, quite fitting. This is the part where Rover is flying on the back of a huge seagull and approaching the "Isle of Lost Dogs" lol! "Over the water and up to them came the sound of a tremendous barking, a noise made up of all the different kinds and sizes of barks there are: yaps and yelps, and yammers and yowls, growling and grizzling, whickering and whining, snickering and snarling, mumping and moaning, and the most enormous baying, like a giant bloodhound in the backyard of an ogre." Sounds a lot like The Fort eh? Hahaha... NOT! I particularly like the stories of dogs rescuing their owners. I've come across several of those lately. Enjoy! One from last weekend's family reunion. My cousin in a snuggle fest with Cortez. The picture was taken by my second cousin. Our second moment of cute is from an email I recvied from one of our great customers. Everyday, at the same time... This cat waits for this dog. He comes and they go for a walk. Titan and King-- great snuggle-buddies! Today was pretty action-packed here at the Fort. I got some great clips of the dogs this morning that I wanted to share with you all. First up is Jake and Ryker. Both of these yellow labs spent the night last night, but were ready and rarin' to go as soon as morning rolled back around! In this clip they are neckfighting, and Gordon comes in for a romp with Jake towards the end. Next we have King and Buddah from the medium side-- these boys were tearing it up all day long. These small guys sure do have a lot of energy! Last clip of the day features look-alikes Kona and Gracie. Kona is a Portuguese Water Dog, and Gracie is an Australian Labradoodle. These ladies were full of spunky attitude and energy today, and kept romping long after the camera was turned off! I hope that you guys found something fun to do outside in the sunshine! The weather today was just awesome. In the daycare today, we caught some cute clips of the pups romping. Upstairs, we saw ball time with Buddy, Oliver, Chloe, and a glimpse or two of Candy. In the medium roll, little Australian Shepherd puppy Thorn has been tearing it up! He played hard with Tikvah and Bogie this afternoon. Also featured in the clip are Diego and Sheldon. Just two hours from the euthanasia deadline, pooch Sunny was spotted by a dog trainer, who adopted her to train for a role in the musical Annie. 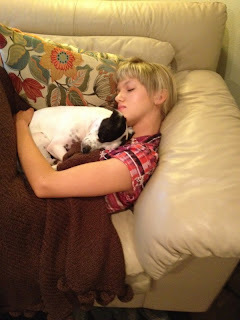 Now this terrier-mix has a new lease on life--not to mention a burgeoning showbiz career! If you're looking for a dog-friendly vacation, I stumbled across this list of dog-friendly attractions and destinations in California. A loose dog caused a crash during the Tour de France.This can serve as a reminder to all of us to keep our pooches leashed, and to keep an eye on them at all times, especially during events and at places with which they are not familiar. At least it was only a barrage of bicycles that this pooch intercepted, running into a busy street would have been much worse for all involved. Luckily, all the cyclists who crashed were able to resume the race, and the pup was uninjured as well. Stumbled across this funny page of the Top Ten Dancing Dogs (the link has videos). These pups sure know how to get their groove on! In Pennsylvania, dog wardens removed 185 chihuahuas from a house. I thought that this article in particular was important to post, because it specifically mentions that the dogs were actually in decent conditions, all named, cared for, and friendly. This was just a situation where kindness spiraled out of control. All-too-often that is how hoarding situations begin--it's tempting to demonize, but it really can come from a good place. More in doggie love-- a Shar Pei has adopted two Siberian Tiger cubs in Russia, after their mother was not able to care for them. The cubs are now living with the mama-dog and her litter of pups. The pictures that go along with the link are just adorable! Diego's mom sent us a few new headshots, and boy is Little D looking adorable! First is your classic look, just Diego smiling ear-to-ear. In these next two you can see Diego sporting the latest in Doggie Fashion. Those glasses are just perfect! There was a lot of great action in the Medium Roll today. New pup Theodore was tearing it up with little Sammy. They were fast friends today, and stuck together throughout most of the day. In this clip you can also see Ruby (with her new summer 'do), Gibson, and Lucy in the back. Sophie is coming more and more out of her shell-- today she had a great romp with Boston Terrier Lucy. The two of them are just adorable together. This clip from the big guys features Ozzy and Zeus, tearing it up! Ha, and I thought last week was exciting! There are many new dogs starting at Fort Fido. Luckily for us they have all been quite pleasant. I think the word is getting out that we are more or less 24/7, folks are excited about that.... I'm glad, because we too are excited. With close to two months of overnight boarding under our belts, we find ourselves feeling positive about the decision thus far. There has been and will continue to be many new things to learn but so far so good. If we know anything, we know dogs and how to keep them happy lol. Things are running smoothly around here. Sorry, got off on a bit of a tangent there, anywho... Meet Gracie, Oscar and Titan! Gracie, same family "sister" of Oscar, is a nine year old, fifty pound, Basset Hound Mix. She was perfect for the Medium Roll. Gracie enjoyed herself imensouly. This blue-eyed beauty played a lot, she was totally in her element here! 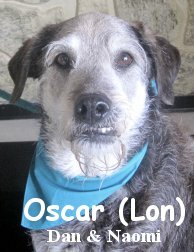 Oscar, Gracie's "brother", is a ten year old, sixty pound, Terrier/Hound Mix. We had him in our Big Roll. The old chap did a fine job mingling with the pack. Oscar is rather spry for his age and he played well with the others. Like Gracie, Oscar had a super good time. Both Gracie and Oscar spoke "dog" fluently. They are a testament to early socialization. We'll be seeing these two on Friday and look forward to it. Last but certainly not least was Titan. What an awesome name! 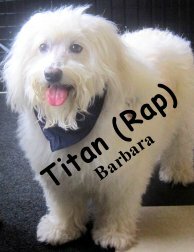 Titan is a five year old, thirty-three pound American Eskimo/Poodle Mix. This dog has a great smile coupled with a wonderfully unique look... Yes, dogs do smile lol. Titan hung out with the pack of the Medium Roll. He didn't play, but he didn't mind being around the other dogs. Titan is a nice and gentle soul. We hope that he will interact a bit more in the future. Titan is more than welcome to attend The Fort and we won't be too surprised if he starts making more friends in future visits. Feast your eyes on this handsome devil! 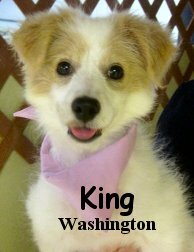 King, is a three month old, eight pound, Shiba Inu and Poodle Mix. Like royalty, this little prince marched into The Fort happy, curious and full of life! King had an all-out blast upstairs in our Little Roll. He played hard, loving every minute of his time here. King really liked our toy selection and pack members. From the clips that follow, you can see that King is learning how to play fair with the others... There's a bit of a learning curve hahaha. Luckily we have some very patient canine teachers upstairs lol! This bundle of cute did great today. He'll stay in the Little Roll for now but he may "graduate" in the future, we'll see how it goes. The Medium Roll may be right up his alley. First rate job today King, hope you were tired. We look forward to meeting you again. This morning (7/16/12) we assessed Doggie Daycare Veteran Gracie. 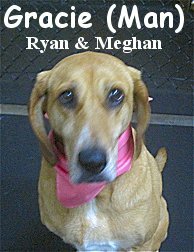 She is a six year old, fifty-three pound, Hound Mix. Gracie handled our Medium Roll with confidence and ease. She has socialized with other dogs quite a bit in her life. Attending Fort Fido was a walk in the park for her, which is always great for us too! Gracie has plans to come to Dog Daycare again because there is a new baby in her family (Congratulations!). A little extra attention from the group at The Fort will be just the ticket for Gracie. Getting out some extra canine energy, should allow things to go even smoother on the home-front. Especially with the new arrival. Welcome, Gracie! We are more than happy to have you. Wonderful work today. Here's a peek at the pooches that spent the day (and for a couple of them, the night) with us here at the Fort. First up is a clip from the big roll-- a whole bunch of pups got in on the action, including Zipper, Stella, Mollie, and Gordon. Everyone got along really well today, and it was pretty much non-stop action from early on in the morning. Also in the big roll, Gordon and Benny were caught loving it up. What great buddies! Over with the medium-size pups, I spotted Tikvah romping with Pupcake, and just had to grab the camera. These two girls both have a lot of sass (don't worry-- that's definitely a good thing! ), and are a great match for each other. They always play together on days they both attend. Disabled Vietnam vet gets to keep service dog-- despite his township's moratorium, and efforts of less-than-understanding locals to get the pitt-mix banned. I remember reading about this back in 2011, when he had to move his dog outside of city limits. I'm relieved to know that the situation has been resolved in a positive way. A missing dog was found (and rescued) from Little Brother Island,which is little more than a chunk of land bone-chillingly close to Niagara Falls. The unfortunate pup broke loose on the Fourth of July, scared by the fireworks. Luckily members of the State Parks Police Swift Water Rescue Team made their way out to the island to bring Lily back to safety. This story is a little bit sad-- one dog, two families, and a legal battle over who gets to keep him. After a surgery left her paralyzed, a couple made a Jerry-rigged wheelchair for her. Even the slight increase in her mobility drastically improved her quality of life. After her story made the local news, handicappedpets.com actually donated a doggie wheelchair to her, something that would have cost upwards of $1000 for a 100-pound dog. An Iraq veteran is seeking to be reunited with his old partner-- bomb-sniffing dog Diego, who is now reaching retirement age. PETA has even asked members to write to the secretary of the Navy in support of reuniting these two. Another bomb-sniffer was in the news-- this time for winning an online contest to be named an American Humane Association Hero Dog. He won the popular vote section, but there is still celebrity judging--I don't think they will fail to see what a special dog Gabe is. P.S.-- Stumbled across this video of a cat walking in a silly way, and it literally made me laugh out loud. Definitely worth a click! 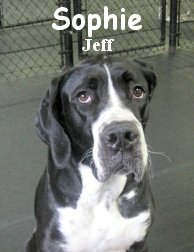 We got some great clips today, showcasing some of the pups that are new to Fort Fido. First up is Baer and his buddy Duke. These boys had a great time rolling around with the big dogs, neckfighting and taking it slow at times, and romping about as well. It's especially cute, knowing that these boys' owners are also friends, to see that the pups definitely caught the friendship bug! In the medium roll, we had little Vizsla Sophie here for her first full day. While she isn't tearing it up super hard, we spotted some flash-in-the-pan moments that let us know more play is coming! I can definitely see Sophie coming a lot further out of her shell--she's already well on the way, and . I hope to see that day soon, and be able to catch a clip to share with all of you! Jake, who is also romping in this clip, is also pretty new to us. He started last week, and has been a little bundle of excited puppy energy ever since then! The rest in the clip have been attending for a while, but it never quits being fun to watch them play! Tikvah, Sammy, and Buddah were in the mix, showing the ropes to both puppy Jake, and newcomer Sophie. In the news, a New York dog wedding is being billed as "the pet wedding of the century," and is set to a break world record, for the most expensive pet wedding. While it seems ridiculous, the entirety of the $250 ticket price (ouch!) 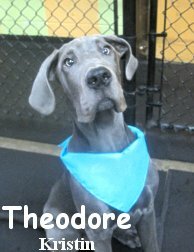 is going to the Lucky Diamond Critical Care Ward at the Humane Society of New York. A lot of vendors are donating their services to make all of this possible. In other funnies, check out this dog that loves trying to chomp on passing cars! Hope that gave you a good chuckle! Wow, what a start to this week, three days and four new dogs giving Fort Fido a GO, excellent! This morning we assessed Honey and Sophie. Honey is a cute little, six year old, eleven pound, Havenese. She has been inherited into the same family as Fort regular Chloe. 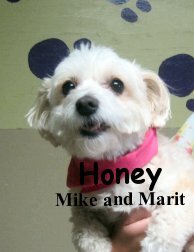 Honey is a very affectionate and happy dog. She pranced into the lobby as cheerful as ever, like she'd been here before. When she headed upstairs to the Little Roll, she wasn't quite sure what to think. Unlike her buddy Chloe, Honey has had only limited experience with socialization and play in her life. Hopefully, expanding her horizons at The Fort will help her make more friends. 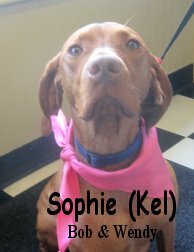 Sophie is a charming, one year old, thirty-three pound, Vizsla. She stayed with us in our ever-popular Medium Roll. Sophie mingled with the group, meeting several different dogs. Unfortunately, she did not play. There is definitely no counting her out though, given time and consistency, she should be playing fast and furious with the others soon. That is our bet anyway. Vizslas are an interesting breed that can really move! We have met a few over the years. They are extremely athletic and have a keen mind, Sophie is no exception. We welcome Honey and Sophie here to Fort Fido with open arms. We will continue to encourage these two to "let their hair down" and enjoy more of what the pack has to offer. Here are all the canine related ones I could find. I skipped a few toons, avoided putting up comics I've put up in the past, minus a few of my favorites. Click to enlarge and enjoy! Although I never saw it, there was a "The Far Side" TV special back in the day. It aired on CBS and was fairly "Riss-kay" at the time. Haha! Here's a link to a semi-dog-realated clip of that special. Extremely funny dark-comedy, as usual! I need to find that special in it's entirety. We had two, new, wonderful canines start at The Fort this morning. 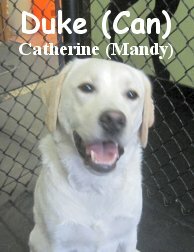 First up for their assessment was Duke. 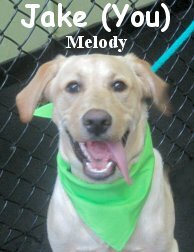 He is a one year old, sixty-one pound, Yellow Labrador Retriever. Duke is a very sweet and happy dog. He is attending daycare to learn how to play fair with other dogs. Duke is getting some great lessons from the Alphas and it is exactly what he needs. We welcome him and are glad he took much pleasure in his stay. Next up was Sophie. She is a two year old, one hundred and twenty pound, Great Dane. Unfortunately, Sophie had a rough start in her early life. Now, she has truly lucked out with new beginnings, receiving an oustanding "Forever Home". Her new owner is doing right by her, it is a beautiful thing, way to go! Sophie has an excellent temperment, she did very well here today. Both Duke and Sophie stayed in Fort Fido's Big Roll. They each got a lot out of their stay which makes us happy! Checkout this clip of the two in action. Duke is learning from Marco Polo while Sophie takes on the ever zestful Zipper. After rescuing a dog trapped on a quarry ledge in Oregon, firefighters reunited the wayward pooch with her owners and received many heartfelt thanks. The poor pup was missing for a week before being discovered on a rock ledge that firefighters had to repel down to. Fortunately for all, Daisy only sustained a couple bumps and bruises. You can check out video of the story here (it's the second or third story). 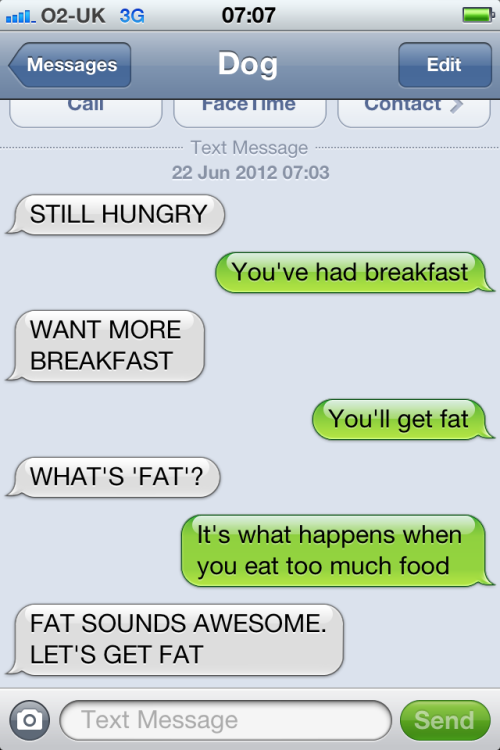 This site is good for a laugh-- it's a tumblr account named "Text from Dog" which features "conversations" between a pooch and his owner. Back in the day we used to just wonder what dogs would say if they can talk, now we wonder how they would use smartphones and social media! 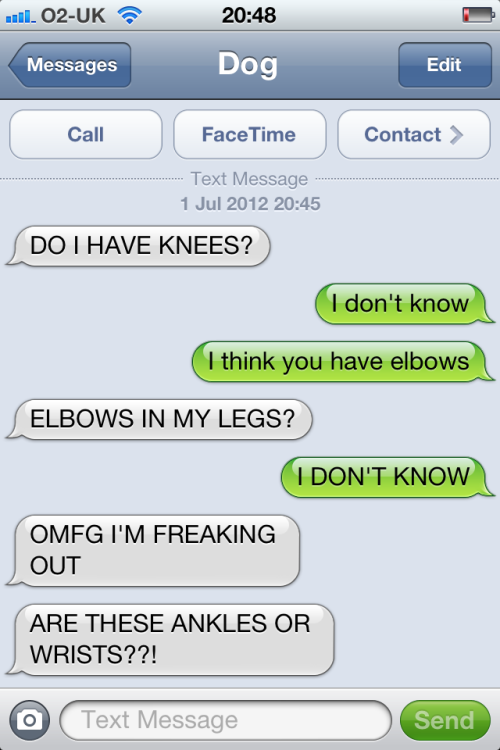 This one definitely made me crack up-- I've wondered this before! A brave man saved a pup from a river. Though her road to recovery is long, she is very lucky that she got the chance for it to start at all. Many thanks to the brave soul who freed her from the weeds, even though there was no way to know if she would bite, who carried her to the car when she couldn't walk, and who took her to the vet. Way to go! Since it's starting to heat up, here is a neat slideshow with some cool pet products (literally!). These are designed to keep pets comfy in the heat of summer. If you are looking for a pet-friendly vacation idea, check out JetSetPets. This neat website features all kinds of information on traveling with pets--worldwide! It also includes a list of the most pet-friendly cities around the globe. This is a really great resource for any pet owner. P.S. I recently heard about some malware that may knock you off the internet! If you believe that your computer may be at risk-- click here to check your computer's function. Surf safely! On the big side, we had Grady and Maximus tearing it up! Grady has been staying with us for a couple of days, and it's great to see that his energy level hasn't been dampened at all--he's ready to tear it up, and Max was ready to romp as well! It was puppy madness on the medium side, with little Thorn and Jake getting everybody amped up and ready to have a great time. Buddah and Gracie couldn't help but join in--the puppies' joy was just infectious. These guys are here during the prime socialization window, and you can really tell how it's going to impact their behavior positively for years to come. A couple quick news links for you guys-- retiring bomb-sniffing dog gets a hero's welcome, and will spend her remaining days with an old friend. A 10-year-old pooch was rescued from George Washington Bridge in new Jersey after fireworks scared the poor old boy away from a Fourth of July Party. He was trying to make his way home to New York City. In the Big Roll, Marty and Zipper where romping in the sunshine this morning. New medium-roller Jake was in a great and energetic mood today-- we caught a bit of him running with little Puggle Buddah. Upstairs, best buds Marlee and Pearl were attached at the hip! They spent a good deal of time playing together today. Twitter helps to find a lost dog who took a train ride without his owner. What is heat stroke, and how can pet owners prevent it? A pup helped to find a missing autistic boy, joining in a massive search effort by an entire community. A police dog, spooked by fireworks, has been found and sent back home. Service dog could help a child with rare disease. We're only beginning to scratch the surface of all the different ways that dogs can be trained as service animals to improve the lives of their human companions. And speaking of training, there's a new trainer in town! Following the success of Cesar Milan and Victoria Stilwell comes Justin Silver. He is "The Dog Guru," and trains pups in New York. I haven't had the chance to watch any of his programs, but I definitely agree with the basic philosophy he has: "A dog’s behavior is shaped by the people in its life, you’re always communicating to your animals, whether it’s directly or inadvertently, through your behavior.” I wish him the best of luck, shaping up those city dogs (and city dog owners!). This article about a Taiwanese photographer is heart-wrenching--but the light he shines on the problem of stray dogs and euthanasia in Taiwan is sorely needed in a culture that does not have the same support network for stray dogs as ours. Even we are not doing so well on finding homes for all the pups we have. These portraits are very thought-provoking, and help incite people to take pet ownership more seriously. You MUST watch the last one. Whoa! That last one is definitely not my dog, talk about dangerous for all involved.